I'm putting together a few things for my class for the next couple of weeks (we go until the 20th!) and wanted to share! We have been reading lots of Gingerbread Boy stories, so we will be spilling some buttons out onto these gingerbread mats when we work on our Magic Numbers. Click the picture above to get it! 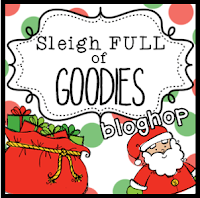 I've linked up with these terrific blog hops full of Freebies! Go check them out! Thanks for the opportunity! I've enjoyed (and spent waayy too much time:) hopping through all the cute stuff!